Not only is March National Nutrition Month,but today is Registered Dietitian Day! The theme of this year’s Nutrition Month is “Eat Right With Color”! As the palate at the right suggests, use a variety of fruits and vegetables to color your plate at every meal every day, otherwise known as “eating the rainbow”. Eat something colorful today, and every day! Sea Salt for Lower Sodium? The other day a patient who has hypertension asked about Sea Salt. He had heard that using Sea Salt was somehow “healthier” and that it contained less sodium that regular salt. 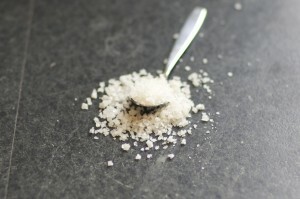 As wonderful as it would be to find a low sodium salt, it simply doesn’t exist – Sea Salt is still salt and high in sodium. for the same amount of salt flavor when those large crystals hit your tongue. Any way you look at it, it is still full of sodium, which is of concern for those battling hypertension. Even those without hypertension should watch their sodium intake since the average American consumes 3,375mg (way more than the upper limit recommendation 2,300mg)! What can be done to reduce sodium without sacrificing taste? The first (and easiest) way to approach this is to limit the amount of processed foods you consume, since the more processed a food is, the more sodium it usually contains. The second is to gradually reduce the amount of sodium you use every day. By reducing the amount gradually, you will be able to wean yourself down, without everything suddenly tasting flavorless. Lastly, experiment with different flavor profiles like herbs, spices and citrus. You may be pleasantly surprised! Clementine – no salt added! 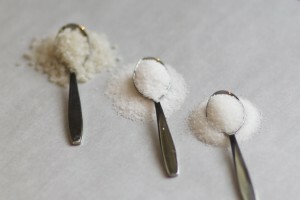 An addendum (March 27, 2011): Another great post on the subject of salt by Lilian Cheung author of Savor.